John Mayer and Sheryl Crow at Verizon Wireless Indianapolis | Nicole, Deipnosophist. The opener was Mat Kearney. I sort of recognized the name but didn’t recognize the music until the last song, “Nothing Left to Lose.” He was very good but I only caught a couple of songs. His speaking voice- and occasionally his singing voice- sounded exactly like Dave Matthews, in tone and in inflection. (As an aside, this is a Radio Now-style artist who could have been a perfect fit for the Taste of Mass Ave). This was a double-header concert with two headliners, and Sheryl Crow was first. We groaned, wishing she had been second so we could leave the show early. There was another couple with us who had similar thoughts. However, once she was onstage, Sheryl delivered a really fun show. I know all the words to most of her popular songs and it was fun to singe and dance with friends. There were some high school kids beside us and it was fun to watch them and reminisce…especially the one girl who reminded me of me: too much energy and melodrama for her own good. Anyway, Sheryl’s set list included mostly her popular songs and her guitar playing was pretty good. She hit a couple of bad notes, but her singing isn’t her forte anyway; her lyrics have a lot of truth and interesting perspective. One song, If it Makes You Happy, reminded me of my time in Memphis and of paging my best friend at 2AM over the speakers at work, playing the song at full blast. Ah, youth. I remember a time when I thought it was OK to use the PA for fun! After a brief break, John Mayer took the stage. I was immediately impressed. From the opening note, it was clear that some amazing musicians were on stage. Like a president can be judged by the cabinet (s)he chooses, a solo artist can be judged by the quality of the musicians surrounding him/her. There was a guitar solo by one of the John Mayer Trio that make me stop dancing and just listen. His style was clear and crisp. In contrast, another musician (bass) had a solo that was just as technically accurate but displayed a completely different style: smooth and full of soul. He took the song and inserted his own brand of cool. The teenagers were a little annoying during John Mayer; several of the boys were so interested in dancing with the girls that they inconsiderately bumped into us repeatedly (despite the expanse of open lawn space). They were also pretty crass and inconsiderate of everyone around them. Youth is wasted on the young. 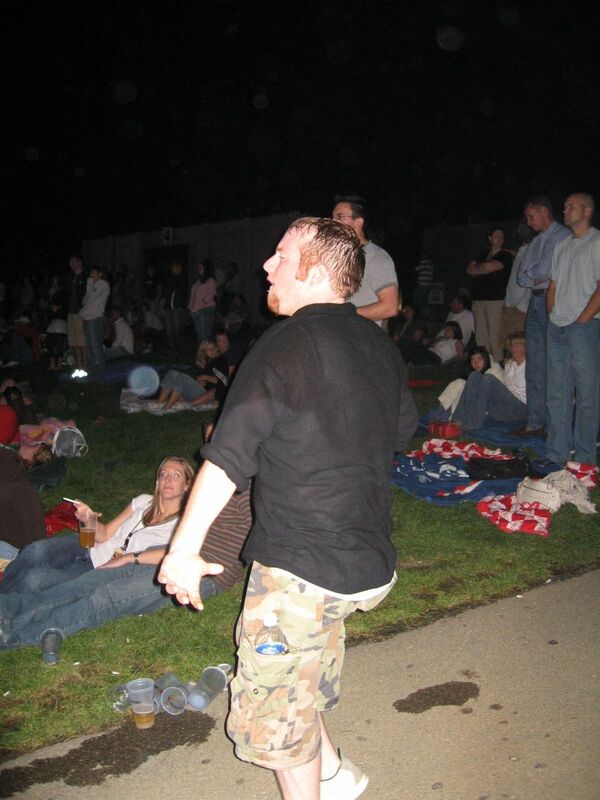 We also saw Dancing Man from the OAR concert! Sometimes being on the lawn provides some crazy comic relief. Mayer is hilarious and at ease on the stage. He forgot the lyrics to “My Stupid Mouth” and tried to ad lib. He laughed and tried to have us help, but he just segued to a different song and ended up with a guitar solo. At the end of what could have been an embarassingly bad flub, Mayer joked, “wow, that was my first ever rock medley.” It speaks to his guitar abilities that he made it sound like every mistake was on purpose. He continued on and delivered the best performance I’ve ever seen him do. Right around the “Daughters” era, he could have stooped to bubblegum pop forever, but he, he took the road less traveled by. This entry was posted in Life in General, Performance Reviews, Reviews by knharter. Bookmark the permalink. Wow. I didn’t know you listened that closely. Thanks for the recap. I would love to go back. I hope you have some Mayer are your beer party. See you there!